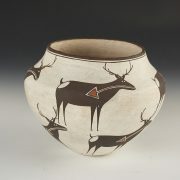 This beautiful bowl was made in the 1970’s. I think it has had two owners. 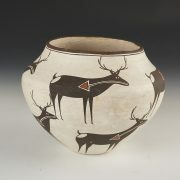 Famous for her animals designs and fine line work, this piece shows the deer and the heartline. She has painted EIGHT deer. 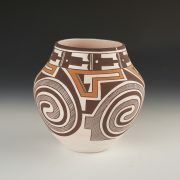 You can see that her clay was the gray toned Acoma clay. It has such a soft and warm look to it. I am honored to be able to show such beautiful work by Lucy. The bowl is signed on the bottom, “Lucy M. Lewis”. It is in very good condition with no chips, cracks, restoration or repair. Lewis began making pottery at age seven, after studying with her great aunt, Helice Vallo. Both of her parents occasionally worked in the nearby town, Grants. Her early pottery was made for tourists. 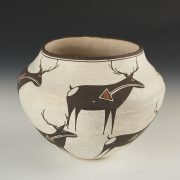 The ash-bowls were easily made and sold for five or ten cents. In the late 1910s, Lewis married Toribio ‘Haskaya’ Luis. The family name was changed to Lewis when the oldest son, Ivan, went into the marines during World War II. She had nine children, seven of which went on to become potters. 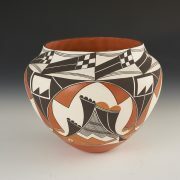 Lewis’ designs were inspired by Ancestral Pueblos (Anasazi), including the Mimbres designs of the Mogollon as well as the Chacoan culture. Her work began to be recognized in 1950 when she won a blue ribbon at the annual Gallup Intertribal Ceremonial. She is certainly one of the matriarchs of Pueblo pottery. 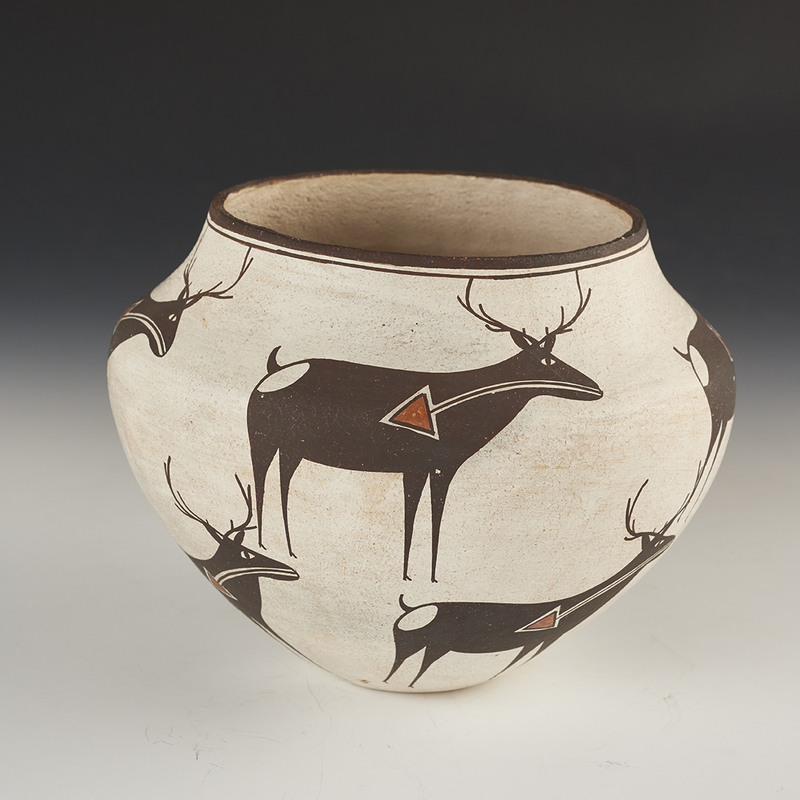 In 1977, Lewis was invited to the White House and in 1983 she received New Mexico’s Governor’s Award for outstanding personal contribution to the art of the state. Her final art show was at the 1991 SWAIA Indian Market in Santa Fe, New Mexico. 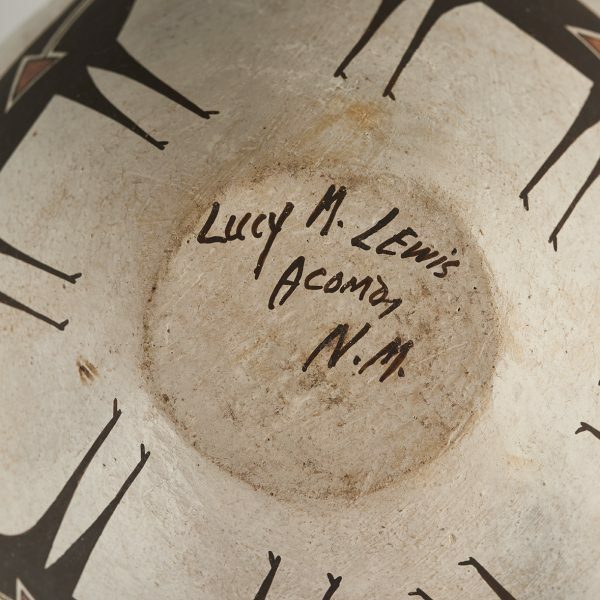 After a long illness, Lucy M. Lewis died on March 12, 1992.